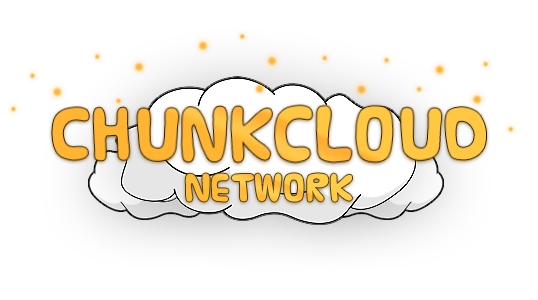 I'm proud to annouce that the network has been officially renamed to ChunkCloud! single aspect of the server and a lot of testing - the 'rebrand' update has finally been completed. A lot of things have changed, and more awesome plugins and gamemodes will be added in the near future. An overview of changed and added server features can be found at the bottom of the page. take some time, but I'm confident that i'ts do-able. Since a lot of new plugins and custom features have been added during the update, I will monitor these plugins and roll out bug fixes if necessary. I will also begin working on adding new gamemodes to the network, though I don't know which one(s) yet. What can I - as a player - do to help ChunkCloud grow? The easiest way to support ChunkCloud is by voting. Voting makes our network be ranked higher on server lists and thus makes more people see and join the network. Telling your friends to join the network is also a great way to help our player base grow again. You can also support us by buying something from the server store. As advertisements on server lists will cost us some money, every little bit with help us out a lot. Update notifications will be sent out on a regular bases in the lobby to all of the players who've joined from that point on. This notification will just contain some information which might be useful for you. The notifications can be read with /mail read in the lobby. Thank you for reading and playing on ChunkCloud! Read this news post for the overview of changed and added features.